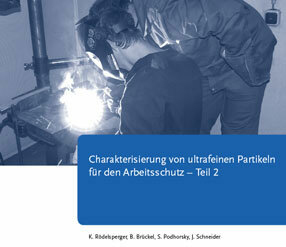 (Nanowerk News) The Federal Institute for Occpuational Safety and Health (BAuA) in Germany has published part 2 of its report on "Characterisation of ultrafine particles for workers protection" (in German only). Dust volume, particle size and surface influence the response of granular biopersistent dust (GBS). From the reanalysis of the GBS administered in an intratracheal test using the transmission electron microscopy (TEM), tumour rates could be predicted sufficiently with a combination of volume and surface (R² = 0,7) or volume and number of aggregates und agglomerates (A+A) or of primary particles (PT) per mg of the dust. Air measurements of the mass concentration and of the number concentration of the particles which were analysed by TEM were evaluated using these doses metric. They were performed during welding, soldering, plasma cutting and for the release of diesel soot at work places and in the ambient air and further on for making copies and for smoking cigarettes. In addition material samples of nanotubes and of ultrafine TiO2 were analysed, for which the binding forces were reduced by a treatment of the particle surface. Measurements of the number concentration of the particles and the mass concentration of the inspirable (E)-, the thoracic (T)- and the alveolar (A)-fraction with the Respicon demonstrated fast coagulation of ultrafine particles at the work place. The deposits of nucleopore filters which were obtained by static and personal sampling of the E-fraction either could be analysed directly by TEM. Alternatively a second filter was deposited by indirect preparation from an aqueous suspension of the original deposit. In the same way as for the GBS which were administered in the experiment, the concentrations of A+A and PT were determined by TEM-analysis. If concentrations of A+A were compared to the concentrations of particles counted by CPC the amount of liquid particles could be estimated. Among the GBS coarse dust samples were present, where the volume was responsible for 99 % of the response, if it was used in a model together with the surface while this responsibility decreased to 93 % if it was combined with the number of the A+A. On the other hand these models explained 94 % of the response of ultrafine Al2O3 by the number of A+A and 93 % for Carbon Black (Printex90) by the surface. Therefore, volume only caused 6 % respectively 7 % of the response. For the E-fraction from the work place samples between 3*109 A+A/mg for welding fumes and 1011 A+A/mg for Diesel soots were obtained, which are well within the range covered by the GBS. In contrast, up to 4*1012 A+A/mg resulted for the sample of ultrafine TiO2. If volume was estimated by using assumptions on the average density of the dust particles from the work place and if this volume was combined with the concentration of A+A, it caused 92 % of the response for oxyacetylene-welding of mild steel, while this percentage decreased to 16 % for Plasma cutting. For the ultrafine TiO2 which was prepared by a surface treatment, only 0,7 % of the response was related to the volume. This amount, in comparison, 145 times was exceeded by the percentage resulting from the A+A.